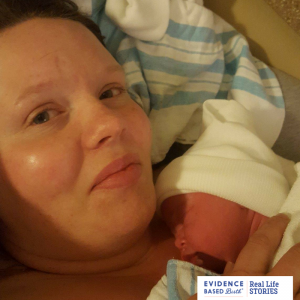 With my first baby, after 20 hours of laboring without any pain management, it came time to push, and at that point I was exhausted and didn’t want to. 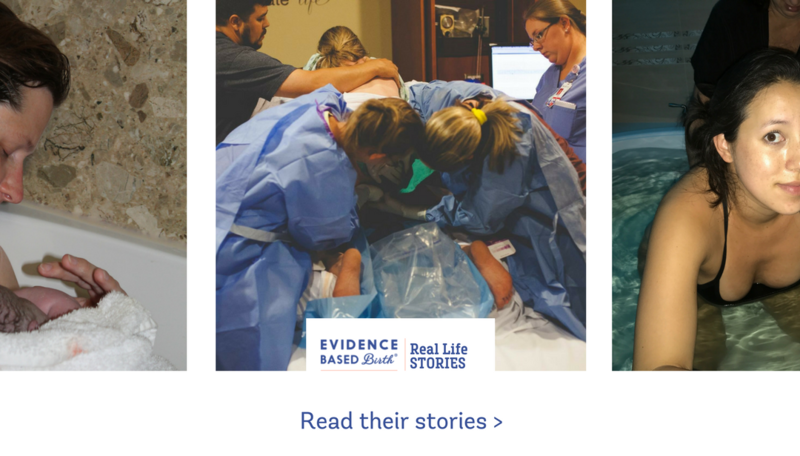 They pulled out the squat bar and encouraged me to choose the position I felt most comfortable in, and I tried just about everything before ending up on my back– any position other than on my back resulted in my baby’s heart dropping dangerously low and so my CNM suggested that I remain on my back. They were all very encouraging and supportive of what I wanted. Although I originally did not want to push on my back, I was so exhausted I didn’t really care anymore. It felt good and was most effective for me, even though I had heard that pushing on one’s back was the worst thing to do. I pushed only with contractions, and after about 2 hours my daughter was born. Turns out she had a nuchal cord and her head was in the 96th percentile in regards to size. Being my first, it took a lot of time for her to get there, but in the end, I had no tearing whatsoever– even with pushing on my back and with her large head. This could be in part to my CNM performing perineal massage beforehand/ allowing for the perineum to stretch longer rather than encouraging me to just push her out quickly. I’d say the only downside to pushing on my back was the immense tailbone pain for about a month long afterwards. I labored at home for two hours, and I only wanted to be on my hands and knees on the couch. My husband encouraged me to consider other positions if it would help ease my discomfort, but my body very strongly told me to stay there. I went into transition in the car on the way to the birthing center and used the handle over the door to help lift my hips when my body was trying to push. 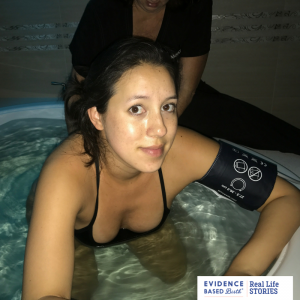 Once we got to the birthing center I was already 10 cm and was told to go ahead and get in the tub (I had requested laboring in the tub) and start pushing. Again I only wanted to be on my knees leaning against the edge of the tub. It felt so good to finally push, and the pain stopped as soon as I started pushing! Once he started to crown, I moved to the bed where I was offered a variety of positions, but again I chose hands and knees. The midwives were so accommodating and helped me position myself. Baby came quickly and smoothly with no tearing. Also, since I didn’t have to labor long, his head was a great round shape. I mostly had a “rug burn” type abrasion with swelling. I feel like letting my body choose the position really aided in a quick, relatively painless delivery with no tearing. My first VBAC I was on a hospital bed semi upright, the intern use counter pressure on the babies head and I was told when to push. Pushing phase was approximately 20 minutes. My baby weighed 7lbs 7oz and I tore but didn’t require stitches. My second VBAC baby was born in the water (hospital) I was sitting up but laying back in the tub. Baby was OP and when his shoulders didn’t follow his head right away, the midwife and my husband held my legs back and I pushed for the next contraction and his shoulders where born. Baby weighed 9lb 2oz and I pushed for approximately 20 minutes. I was not directed when to push or told what position to be in. My third VBAC was also born in the water (hotel birth), I was sitting up, leaning to one side and back a little. My memories of this birth are more vivid because it was completely drug free. I pushed for 2 contractions, without directions and had no tearing. Baby was 9lbs 5oz and I pushed for less 10 minutes. 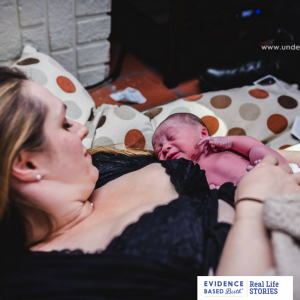 I was planning an unmedicated hospital VBAC birth with a midwife practice but ended up having a precipitous transitional stage of labor while at home and ended up delivering my son unassisted while my husband was out with our daughter and I was home preparing our things to head to the hospital. I was not directed in any way to push nor was encouraged into a particular position (since I was by myself). I instinctively assumed a side-lying position as it felt the most comfortable to me and seemed to take the edge off of the intensity of crowning. My body pushed on its own a couple of times and I experienced the fetal ejection reflex. I ended up having a minor 1st degree tear that I did ultimately decided to suture since it was bleeding. I chose my birthing position as my body felt it needed to be in. I actually thought I had to go to the bathroom but as soon as I sat on the toilet, I knew I couldn’t be in that position. I didn’t know I had already transitioned. My husband called the midwife in and when she came in I was on my knees swaying back and forth. She asked if I wanted to be checked and I said yes. I walked from the bathroom to the window ledge bed (for partners) and laid on my left side. She checked me and she said I was ready to push. She actually told me not to until they could get everything ready. I literally did not push. I breathed my baby down and out (HypnoBirthing). My body really did it all on its own as I laid on my left side! I chose to have a water birth at a birth center, and after laboring in on my knees in the shower and sitting on a toilet backwards, I made my way to the tub. I initially sat with my back against the tub facing my doula and midwife, but that only lasted for a couple of contractions before I turned around. I turned onto my knees with my arms resting on the edge of the tub. 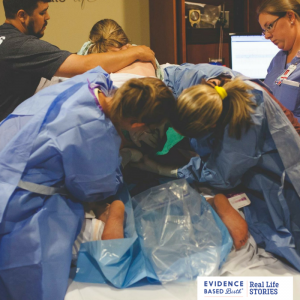 My midwife and doula remained at my hips while my husband held my hands and stayed close to my head. It felt much more natural and comfortable to me when I knew that I needed to push. I arrived at the hospital at 9.5 cm and fully effaced. 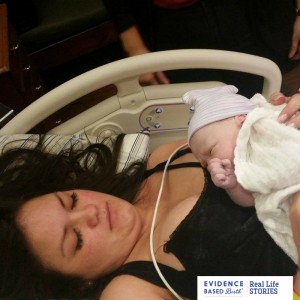 When I got onto the delivery bed, I was facing the back of the bed with my arms draped over the head of the bed. The midwife asked if I would like deliver in this position and I said yes. Within ten minutes, I felt the urge to push and delivered her after about three minutes.